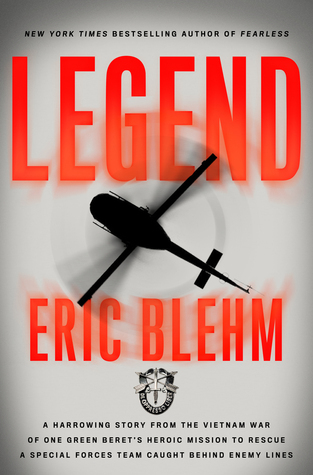 In Legend, acclaimed bestselling author Eric Blehm takes as his canvas the Vietnam War, as seen through a single mission that occurred on May 2, 1968. A twelve-man Special Forces team had been covertly inserted into a small clearing in the jungles of neutral Cambodia—where U.S. forces were forbidden to operate. Their objective, just miles over the Vietnam border, was to collect evidence that proved the North Vietnamese Army was using the Cambodian sanctuary as a major conduit for supplying troops and materiel to the south via the Ho Chi Minh Trail. What the team didn’t know was that they had infiltrated a section of jungle that concealed a major enemy base. Soon they found them¬selves surrounded by hundreds of NVA troops, under attack, low on ammunition, and stacking the bodies of the dead as cover in a desperate attempt to survive the onslaught. What followed would become legend in the Special Operations community. Flown into the foray of battle by the courageous pilots and crew of the 240th Assault Helicopter Company, Benavidez jumped from the hovering aircraft and ran nearly 100 yards through withering enemy fire. Despite being immediately and severely wounded, Benavidez reached the perimeter of the decimated team, provided medical care, and proceed¬ed to organize an extraordinary defense and rescue. During the hours-long battle, he was bayoneted, shot, and hit by grenade shrapnel more than thirty times, yet he refused to abandon his efforts until every survivor was out of harm’s way. This story is about Staff Sgt. Roy Benavidez a Green Beret who risked his own life to rescue another team that was pinned downed in Cambodia. This was time during the Vietnam War that our leaders wanted to stop the supplies that were coming in from Cambodia, during the Johnson administration. Lack of communication was just one of the problems that day. This book begins with his early life losing both parents and being taken in by and Aunt and Uncle, along with their grandfather. The grandfather would pass along stories and it is because of these stories and that you help your fellow man that you are lead up to the day and the battle that is taking place. Roy is on his way to breakfast when one of the helicopters is coming in for fuel and ammo. He over hears the crew talking and knowing that a team went out earlier he asks about one of his friends and is told about what is taking place, he immediately grabs his medic kit and hopes into the helicopter. When he gets to the area he can barely see two of the men but he can see all of the rounds being fired, he asks the crew to drop him off which was about 75 yards from where this giant ant hill was and where a few were hold up. He ran across zig sagging but still took a round to the leg. He made to the hill with medical supplies and more ammo which they were running out of. As the battle grew more the spotter called in for an all-out code signaling that a troop was about to be overrun. Though they were in Cambodia within 5- 10 minutes he had multiple jets dropping bombs, napalm, firing there cannons and yet the enemy still were coming in mass amounts. Roy had got the other men together plus a member of a down helicopter crew, and they were putting up a last stand or so they thought. One of the helicopters only took half the fuel and added extra ammo and rockets and by losing their two door gunners two Warrant officers step up and they took off with a crew of entirely officers, unheard of. When they arrived they knew they had one last attempt at a rescue because of darkness, when they went in Roy and another man got all of the men in plus Roy went back to get more and to double check, he was wounded multiple times and collapse on the floor of the helicopter. Because when they went in they were dressed liked the enemy they had actually put Roy in a body bag thinking he was the enemy and dead, until the Sgt. Major told them to get him out and they felt a faint pulse, he was rushed to a hospital. The survivors were all sent to different hospitals and had thought that no one made it out. It was not until a story made it to the newspaper and one of the survivors wrote the Army that people were realizing what other people already knew that Roy was a Hero and should be awarded the Congressional Medal of Honor. It would be thirteen years later but it did happen. I of course am leaving out a lot from this book but this is a great read for everyone and I do want to mention the 240th Assault helicopter Company who provided support and lost three helicopters and crew members that day in rescue attempts and providing support for them. Once again this goes to show you the brave men from all of the wars and these men from Vietnam are finally getting their stories told. What a legacy for the Green Berets as well, and his family. A great book. I got this book from net galley. I give this 5 stars.